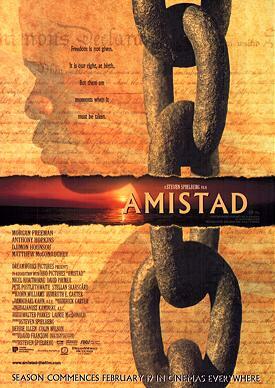 Steven Spielberg has gained even more ground as a credible filmmaker with his latest production, Amistad. Like Schindler's List, it's a story of inhumanity that is breathtaking in its scope. It begins with a slave takeover of a Spanish ship, the Amistad, on the high seas north of Cuba in 1839. Led by Cinque (Djimon Hounsou), the slaves slaughter the crew, leaving only the two slave-owners alive. Though the survivors promise at knife point to take the ship's occupants back to Africa, the Amistad ends up off the New England coast of the USA. With the slaves captured and the ship impounded, the authorities are faced with a difficult question: what to do with the ship's human cargo? This essentially legal question drives a film that is part history lesson, part courtroom drama, and all indictment of the evils of slavery. While the legal arguments over the slaves continue, we re-live by flashback the horrors of the Africans' capture and treatment aboard a Portuguese slave ship operating illegally along the coast of Sierra Leone. I say "re-live" because that is how it feels - no mere witness from afar, the audience is drawn completely into the reality of the situation. Wisely realising that no cinematic tricks are necessary to play up these scenes, Spielberg has filmed them in a highly realistic fashion. No special lighting or camera angles need feed our horror, the reality is enough. We see the cruelty, the lash, the desperation as if we were on the ship ourselves. Cast naked into the hold of the ship in chains, wracked by sickness and punishment, the Africans' torture is frankly portrayed and is stunning in its effect. The fascinating thing about this treatment is that the viewer identifies much more with the Africans than the Americans and Spaniards. While the Caucasian characters are early 19th Century abstractions, interesting but removed from us by time, we have lived the raw emotions of the Africans' enslavement and have an emotional bond with them. Spielberg cleverly reinforces this by being selective in the use of subtitles. Some scenes in Spanish and the African language Mende go untitled when the director wants us to focus on actions rather than words, or when he is stressing one perspective over another. In an inspired move, the Africans speak throughout in Mende and the subtitled translations are refreshingly colloquial. On a practical note it makes sense; the Africans hardly have time or opportunity to learn English. But it also forces us to acknowledge the slaves as people like us, no less intelligent though they see things from a different perspective. Until now I had never realised how movies about slavery so focused on the arguments between whites rather than the story of the blacks. What Spielberg has done is put the African slaves right back into the middle of their story, and the result is breathtaking. 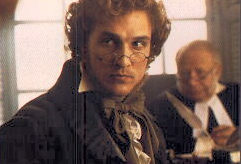 There are other threads in this movie of course: the legal efforts of the small-town lawyer Baldwin (Matthew McConaughey), the abolitionist cause of Joadson (Morgan Freeman) and Tappan (Stellan Skarsgård), and the pitting of former U.S. President John Quincy Adams (Anthony Hopkins) against the will of the incumbent Martin Van Buren (Nigel Hawthorne). Adams' speech to the Supreme Court near the finale of the movie is obviously meant to be an emotional high point but falls flat. For an American audience its ringing evocation of the Declaration of Independence may work, but to me it felt as if, for a moment, the film was sliding away from reality into moral indulgence. The real emotional highlights of the film are always with the Africans, especially Cinque, who comes across resoundingly as a normal man pushed to extremes rather than the cliched "noble savage" so often found in fiction. It's an impressive movie which brings alive a forgotten story from the slaving days of American history, a small part of the clash of wills that would ignite the Civil War some 20 years later. More than that, it's a powerful reminder of the values of humanity and how they can be debased. An inspirational movie and highly recommended.